Quick update on the Code.co.uk domain sale. I’ve received offers from eight businesses, and now decided to list the domain at auction as part of Sedo’s next Premium Auction Event. 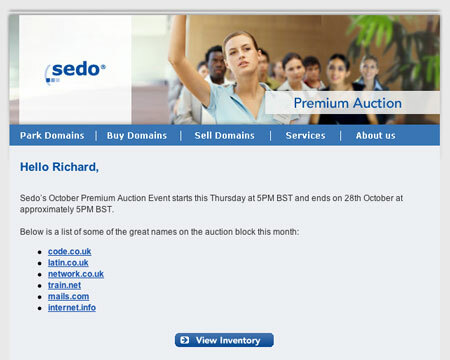 The domain got top billing in Sedo’s auction mailshot, so look forward to seeing how much interest the auction gets. Bidding opens Thursday 21st October and ends on 28 October at 5pm GMT. Full background on the sale here and at Gary Taylor’s blog.